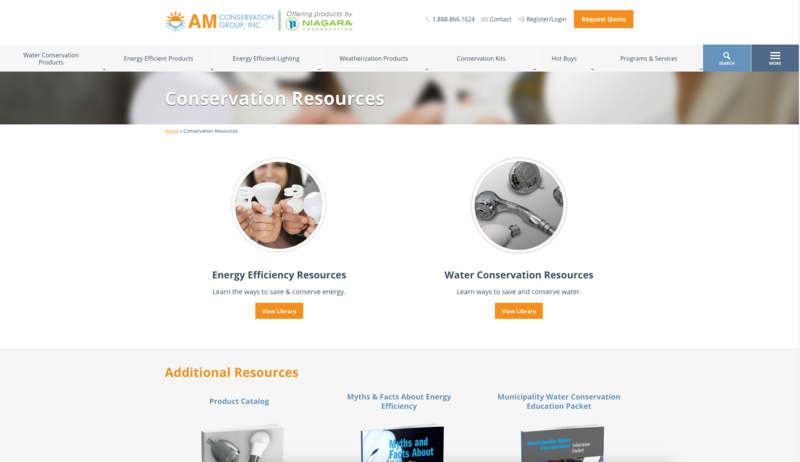 AM Conservation Group manufactures conservation products that help consumers save money on their energy and water use. The company uses inbound marketing for two main purposes: to help attract its own clients—including utilities companies and vendors and contractors that work with utilities companies on conservation initiatives—and to help its clients work to promote green energy programs to the end consumers through educational content. Danielle Marquis, the Director of Strategy at AMCG, spoke with us to provide some details and insights into the inbound marketing efforts of the company and how they’ve paid off. Can you provide a little background on the inbound marketing strategy at AM Conservation Group? We began implementing an inbound marketing strategy about a year ago to drive more leads to our sales representatives. We already were producing customer-facing content, because it's something that we would include in the conservation kits that we would develop for clients. So it was a logical extension of that. Some of our clients are really big utilities, but some are really small municipal water utilities, for example, and they don't have a lot of resources. They might not even have a marketing department. So the tools we put together are going to help them do their jobs a little bit better and make it a little bit easier for them. So, it's less about bringing in leads to your own site and more about helping the people who are already your clients bring in new leads and customers? That's so. We're sending out our content to existing clients, but it's also being used as an inbound strategy as well to bring in new customers to purchase our products. And then once they've purchased it, what do they do with that? How do they promote water conservation or energy conservation at their utility to their client? What are the main goals behind your inbound strategy? The primary goal is lead generation, and then the secondary goal would be providing valuable information to our clients so we're a go-to resource for them. When they're looking for content to share with their customers, we want them to really feel comfortable coming to us, and know they're going to get a bunch of content they can then reuse, and it'll be plug and play for them. Our clients are stretched thin and are generally appreciative of this support. By providing this information, we’re able to help them promote their existing programs or prime their customers for programs about to be launched. What does your strategy look like? What sort of tactics and tools are you using? Our inbound strategy is focused on the audience personas and customer journey maps we’ve developed. We didn’t want to just develop content and see what happened—we wanted to make sure it was based in what our clients wanted and what would help them do their jobs easier. Some of the research we did was trying to figure out what they were saying they wanted, but the research was also trying to figure out what they needed that they didn't know they wanted yet. And that was the genesis of the actual strategy. Our content is primarily delivered via our website. On the website we have a robust resource library full of downloadable content about energy efficiency, water conservation and weatherization topics. We also have a blog where we post original content and we’ve developed a whole series of installation videos for YouTube. These channels are supplemented with articles our staff writes for industry publications and the like. We promote these resources via email, social media and paid search. Are there any particular tactics or content pieces you’ve found your audience has really responded to? The most popular download we've created is a water conservation toolkit. There isn’t that much content available on this topic and it’s typically small municipal utilities that need it. It's really a kind of marketing campaign-in-a-box for water utilities. It includes some emails for them to use as templates to reach out to clients, and posters they can put up around town or in offices, then all sorts of social posts and kits—to help them to do their own marketing campaign around water conservation. That one’s really popular. We’ve had a lot of downloads on that. 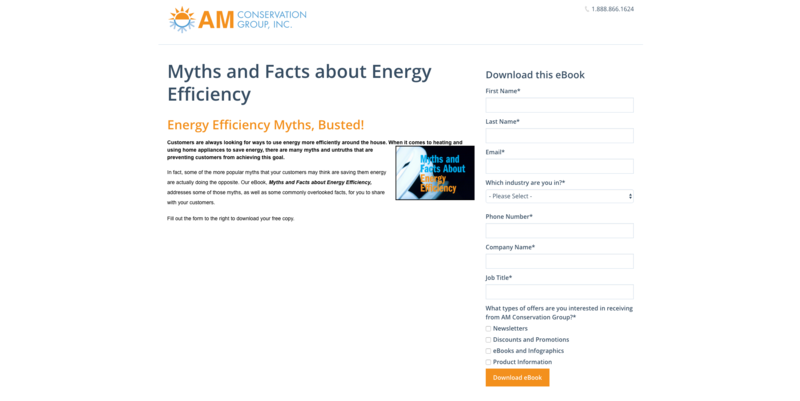 And then our highest conversion rate came from our Myths and Facts about Energy Efficiency eBook. A lot of customers have a hard time understanding why their utility would pay them to use less energy and others are just skeptical of energy efficiency in general. This is a great resource to overcome those objections and encourage customers to participate in energy or water conservation programs. And, finally, installation videos are always a hit. We link to these with QR codes on our packaging to make self-install products easier on the customer. Has your inbound marketing helped you learn anything about your audience and the kinds of issues they’re interested in? Yes, definitely. We log and analyze metrics monthly to learn about our prospects’ behavior and to help identify new content to develop. Testing is also a big part of our strategy. It really helps us fine-tune things like email subject lines and when to post on social for maximum benefit. Our clients are interested in white papers that dig into the verifiable savings from our products, kits and program designs. These savings are independently evaluated in utility programs, so it provides some comfort to prospects working with a limited budget and in need of claimed savings. Corporate clients are more interested in how we can use packaging and kit design to help achieve greater engagement in their corporate sustainability programs. How can we make it cool? We’ve had a lot of fun working on kits for some pretty big-name clients and are currently developing a bunch of design-related content for that audience persona. I’m excited about that. Has there been any lesson you’ve learned in your green energy inbound marketing efforts that you think other marketers might benefit from? I’m a firm believer in the power of data and testing. Gut instincts are great to help develop a test, but they don’t really have a place in the modern content marketer’s toolkit. We need to be smarter than that. By layering analytics on creativity, we can cut through the clutter in the marketplace and better position our brands for the ultimate goal, which is to make the world a better place.